Check out Altra's Everyday shoes! UPDATE: ENTRIES TO ENTER TO WIN A PAIR OF SHOES HAVE CLOSED! A WINNER WILL BE ANNOUNCED AT THE END OF #RUNCHAT. This week's #RunChat (8 p.m. ET Sunday, Feb. 11) welcomes back our longtime friends with Altra Running ... but for a little while this weekend we're going to talk about what shoes you wear when you're NOT running! That's because Altra is showcasing its "Everyday" line of shoes -- yes, that's right! Shoes that are actually comfortable while you're at work or a wedding or you just want to have a cool, casual look! Don't forget ... Sunday's #RunChat kicks off at 8 p.m. ET Sunday, Feb. 11! Click here to visit Altra's website to check out more Everyday shoes! There's a big game on TV this Sunday, which means that we're continuing something that's become somewhat of a tradition in the first week of February - creating a NEW RockMyRun #RunChat Mix! RockMyRun is an awesome app with a ton of great mixes to keep you motivated on your workouts. Over the past few years we've created some AMAZING #RunChat mixes created by YOU, the #RunChat community. Be sure to visit rockmyrun.com for more information about this app, how to download and to find all the #RunChat mixes from the past few years! At Sunday's #RunChat - 10 p.m. ET Feb 4 - you'll be creating a mix full of weird, wild songs. Be sure to be there on time for the first couple of questions for the next mix that will be available in a few weeks! 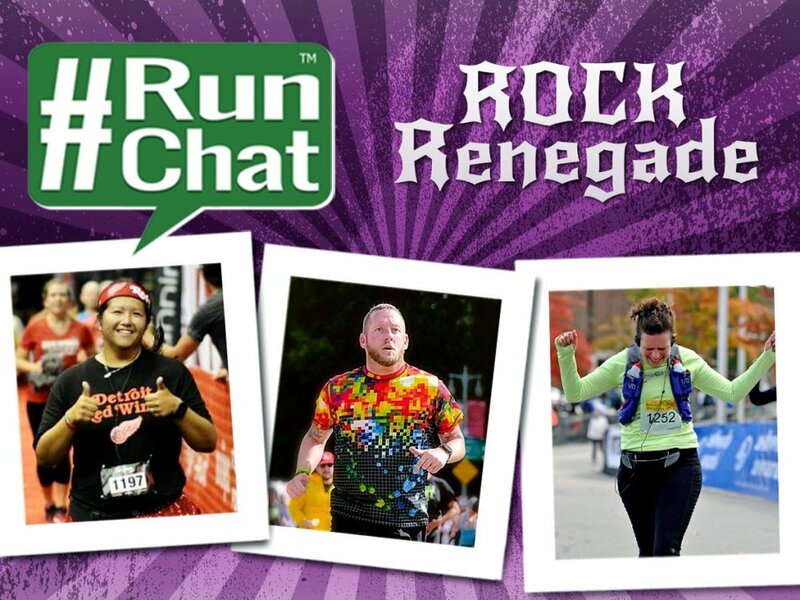 And as part of this week's #RunChat, you have two chances to win a RockMyRun membership! The first way to enter is to simply copy/paste the below into a tweet AND answer at least one question on Sunday to be entered. Your tweets in the entry will also help make the next #RunChat mix! You can vary the tweet, but it must tag @RockMyRun, use the #RunChat tag and include a link to this past. One winner will be selected at random and announced sometime Monday afternoon. Retweet or liking of tweets do not increase your chances of winning. One winner from the retweets will be chosen at random and also announced on Monday, Feb. 5! This week's #RunChat - 10 p.m. ET Sunday, Jan. 7 - welcomes a new sponsor with Science of Speed. Join us for the first chat of the year to talk about your 2018 goals! Science of Speed is an endurance sports coaching, testing and analysis company that serves athletes across the country training for running, cycling, triathlon and beyond. Coaching is administered virtually, making it easy to connect with your coach and complete your workouts whether at home or on the go. "Coaching is not just for elite athletes -- runners of all abilities and experience levels can benefit from working with a Science of Speed coach," Science of Speed tells us. "It is for athletes of all shapes, sizes, ages, and with a wide variety of goals." At Science of Speed, coaches take pride in their professional life as well as in their own individual sports. Each coach is certified and completes regular continuing education courses to stay current on research and methodology. In addition, our coaches consistently train and compete in events of their specific sports. Science of Speed says coaches will provide honest feedback and challenge you to take on workouts you never thought possible, and will always do so while cheering you on and pushing you to be more confident in your athletic abilities. Then join Sunday's #RunChat at 10 p.m. ET and answer at least one question to be completely entered! Three people who retweeted that tweet AND answered a question will be chosen in the final five minutes of #RunChat. Also be sure to sign up to get a 10% discount from Science of Speed coaching and gear! Click here to get on their email list. As 2017 draws to a close, we're excited to welcome a new sponsor to this week's #RunChat -- JackRabbit. JackRabbit is a fitness retailer brand that offers products and experiences with running at the core, as well as other products related to recovery, yoga, cross training, cycling, swimming and more. JackRabbit tells us that they're "transforming movement into adventure by personalizing the fit process and helping find the perfect shoe for all of our customers." They also offer free gait analysis in-store to help find the perfect shoe for every foot and fitness activity. You can check out JackRabbit online or at one of 62 stores across the U.S.
As part of this week's #RunChat, you can get 15% off a purchase of $100 or more at JackRabbit.com with code RUNCHAT15 through Saturday, Dec. 23. JackRabbit also has an awesome prize pack up for grabs at this week's #RunChat! To enter to win simply retweet the tweet below by 9:45 p.m. ET Sunday AND answer at least one question to be entered. We will choose two winners - one male and one female - at random and announce them at the end of the #RunChat hour. JackRabbit will also have an exclusive #RunChat discount after the chat! Simply fill out your information below to get added to their email list, then watch your inbox for a new code on Monday. We're a bit sad that this week is our FINAL #RunChat of the year with Road ID as a sponsor. We've had #RunChat with us throughout the year with several opportunities to win gift cards and grab discounts, and this week is no different! To close out the year, Road ID will have a chance for you to win a new ID for you AND a gift card for a friend or family member at this week's #RunChat, which is at 8 p.m. ET Sunday, Dec. 10. Tweets are due by 7:45 p.m. ET Dec. 10. Retweets and liking of tweets do not increase your chances of winning. One winner will be selected at random and announced in the final 5 minutes of #RunChat. As part of this week's chat (10 p.m. ET Sunday, Dec. 3), you could win a new GPS watch from Garmin - the Forerunner 35. This week's #RunChat, which kicks off at 8 p.m. Sunday, Nov. 26, features one of the coolest giveaways we've ever had -- a marathon relay giveaway. You voted on Twitter this past week to decide on the giveaway -- one person wins and that person gets to pick three of their friends to join them on the team at the 2018 Foot Levelers Blue Ridge Marathon. The race, known as "America's Toughest Road Marathon," is coming to Roanoke, Virginia, on April 21. The race features 7,430 feet of elevation change -- more than any other road marathon in the U.S. -- and includes a portion of the Blue Ridge Parkway and numerous other climbs in the southwest Virginia city. The marathon relay team will divide the course up into four unique challenges -- click here to check out it, as well as some important guidelines and rules about the relay. To enter to win a spot for your team, tweet the below by 7:45 p.m. ET Sunday AND answer at least one question during #RunChat. One winner will be selected at random and announced in the final few minutes of #RunChat. The winner is responsible for finding three people to run on the team (you cannot change team members after signing up). You're also responsible for your own travel costs to/from race and any other expenses during race weekend. You can have a variation of the tweet above, but entries must include a tag to @BRM26pt2, a link to this post and the #RunChat tag. Retweets or liking of your entries do not increase your chances of winning. This week's #RunChat - 10 p.m. Sunday, Nov. 19 - welcomes back our longtime friends at Altra Running! And as part of this week's chat, you'll have a chance to get your cross-training and off-season running questions answered by special guest Jeff Browning! Jeff is a running coach, a family man and has a wide variety of experience with cross training, ranging from crossfit to skiing to rock climbing. Jeff's recent running highlights include finishing in 4th place at Western States, winner of the Bear 100, winner of Coyote Cohorts Backbone Trail Ultra, and 20th at UTMB. He has has a record time for "The Double," which is a back to back Western States 100 and Hardrock 100 (he was 4th and 3rd at these races respectively), he's gone top 5 at Run Rabbit Run multiple times, he's won HURT 100, Zion 100, Grindstone 100, ... the list truly goes on! During Sunday's #RunChat, you can ask Jeff questions directly about cross training, winter running and more. He'll be behind the @AltraRunning account from 10 to 11 p.m. ET. We're excited to have RunLites back at this week's #RunChat, which kicks off at 8 p.m. ET Sunday, Nov. 12. This is the second straight month having RunLites with us, so please go give them a follow on Twitter! You could win a pair of RunLites by retweeting the tweet below before the chat begins and answering at least one question during #RunChat. Two winners will be selected at random and be announced in the final 5 minutes of the chat. RunLites are exactly as they sound -- they're lights you run while running. The lightweight gloves, or a lightweight Sling, have a LED light pouch so you can easily wear your lights to be seen AND to see where you are going. The RunLites LED lights -- which are sold separately from the gloves -- are rechargeable, so there's no need to constantly buy batteries. RunLites tells us that people love how lightweight the gloves are, how bright the lights are, and how they help people feel safer on a run. As part of this week's #RunChat, we'll have an amazing discount code -- RCHAT25 -- for you to grab a pair of RunLites at gorunlites.com for 25% off! This code is good through the end of the year, so grab a pair for a friend as a Christmas present too! National Runner Safety Month is here and we have some great things line up to help you stay safe on your runs all year! We start with this week's #RunChat -- 10 p.m. ET Sunday, Nov. 5 -- as we continue our year-long sponsorship with Road ID, the company that makes it easy for you to wear ID with you on your runs! Go grab $5 off any purchase at roadid.com! So why not get yourself an ID RIGHT NOW ... or maybe a new ID ... or an ID for your significant other or friends and family. Road ID also has several other safety-related products, including lights and reflective gear! CLICK HERE to grab your $5! You can also get a free shipping with a purchase of $50 or more! Time to stock up on PRO Compression! This week's #RunChat -- 8 p.m. ET Sunday, Oct. 22 -- welcomes our longtime sponsor PRO Compression! The second and third way to enter to win a pair is to retweet and/or like the tweet below AND answer at least one question in Sunday's #RunChat to be entered. We'll choose one winner from the retweets and one winner from the likes at random. The fourth way to enter to win is to fill in the blank in the tweet below by 7:45 p.m. ET Sunday. You can alter the text, but please include the link, the #RunChat tag, and @PROCompression in your tweet. One winner will be selected at random and announced near the end of #RunChat. A fifth way to enter is over on Facebook. One winner who enters there by 7:45 p.m. ET Sunday and joins #RunChat is entered to win! You can also get 40% off your PRO Compression order when you use code RUN17 at procompression.com! With a new look, Road ID is back with #RunChat! This week's #RunChat -- 10 p.m. ET Sunday, Oct. 15 -- continues our year-long sponsorship with Road ID, the company that makes it easy for you to wear ID with you on your runs! Also, as part of this week's #RunChat you get $10 off any purchase at roadid.com! So why not get yourself an ID RIGHT NOW ... or maybe a new ID ... or an ID for your significant other or friends and family. CLICK HERE to grab your $10! You can also get a free shirt with a purchase of $50 or more. As part of this week's #RunChat, we'll have an amazing discount code -- RCHAT25 -- for you to grab a pair of RunLites at gorunlites.com for 25% off as well as the chance for you to enter to win a pair! To enter, simply tweet the below by filling in the blank by 9:45 p.m. ET Sunday, Oct. 1 AND answer at least one question during the chat. Please enter only once per Twitter account. Retweets and favoriting of tweets do not increase your chances of winning. One winner will be selected at random and announced in the final 5 minutes of #RunChat on Sunday. We will have TWO WINNERS if @RunLites gets to 1,500 followers on Twitter by the end of Sunday's #RunChat. Be sure to follow them now! Kick off the final third of 2017 with #RunChat at 10 p.m. ET Sunday, Sept. 3 as we welcome back our friends at the Foot Levelers Blue Ridge Marathon. If you're not up for the full course, but still want to run a part of this incredible course with friends, join the four-person marathon relay team. There is an extremely limited amount of space for a relay team as there are only 14 teams of 4 people. CLICK HERE for more information and to sign up with your friends. You can also use code BRMCHAT20 to get 20% off the relay team (and the 10K, half and full marathon)! Next year's event also features a chance for runners to get DOUBLE that elevation change with the Blue Ridge Double Marathon. This is the second time this race is an "official" event -- for several years a group of dedicated runners completed the course before the marathon started, all for some bragging rights. For this week's giveaway: Two winners will be selected at random and announced in the final 5 minutes of #RunChat. You can vary the tweet from above, but please make sure @brm26pt2 is tagged, the link to this post is included and the #RunChat tag is included. Winners are responsible for their own travel expenses, hotel stays and anything else you purchase on your trip. You can sign up for the 10k, half or full marathon and get 20% off with code BRMCHAT20 at blueridgemarathon.com. Altra Running is the sponsor of the Sunday, Aug. 20 #RunChat, which begins at 10 p.m. ET. Get $10 off a Road ID purchase! This week's #RunChat continues our year-long sponsorship with Road ID, the company that makes it easy for you to wear ID with you on your runs! We're excited to have The North Face Endurance Challenge Series at #RunChat for the third time in four weeks! EVENT FEATURES: This race course will not only start at the highest elevation within the North America series at 7,000 feet but it will also climb to the highest elevation of 10,000 feet. The North Face Endurance Challenge cruises along the Wasatch Back, part of the Wasatch Mountain Range in the resort destination of Park City. Athletes will navigate this world-renowned ski destination using a mix of double and single track trail, ski runs, mountain bike trails and various dirt access roads. The event's stop in Utah features a marathon, a 50K and a 50 miler There's also a marathon relay team and a kid's run! You can change up the tweet if you'd like, but please make sure @thenorthfaceecs is tagged, there is a link to this post and the #RunChat tag is included. To be fully entered, you must also answer at least one question during the chat. Two winners will be selected at random and announced in the final 5 minutes of #RunChat, which starts at 8 p.m. ET Sunday, July 9. Retweets of your entry and/or others liking your tweets do not increase your chances of running. Please enter only once per Twitter handle. We're excited to have The North Face Endurance Challenge Series at #RunChat for the second straight week! As part of this week's #RunChat -- which kicks off at 8 p.m. ET Sunday, June 25 -- we're taking a closer look at the event's stop in Wisconsin. WHERE: Kettle Moraine State Park, 60 miles southeast of Madison. EVENT FEATURES: An ideal course layout for elite speedsters and those taking their first strides in the world of ultra trail running, The Endurance Challenge Wisconsin course is run-able from start to finish, provided that you’ve trained properly. A large portion of the course takes place on the renowned Ice Age Trail. The event's stop in Wisconsin features numerous events from a 5K all the way up to a 50-miler. There's also a marathon relay team and a kid's run! To be fully entered, you must also answer at least one question during the chat. Two winners will be selected at random and announced in the final 5 minutes of #RunChat, which starts at 8 p.m. ET Sunday, June 25. Retweets of your entry and/or others liking your tweets do not increase your chances of running. Please enter only once per Twitter handle. The North Face Endurance Challenge Series is BACK with #RunChat! For three out of the next four weeks, we're excited to have The North Face Endurance Challenge Series back for #RunChat! As part of this week's #RunChat -- which kicks off at 10 p.m. ET Sunday, June 18 -- we're taking a closer look at the event's stop in Ontario. WHERE: Blue Mountain Resort, 90 miles outside Toronto. EVENT FEATURES: Featuring the most pronounced elevation gain trail race in all of Ontario, The North Face Endurance Challenge cruises along the Niagara Escarpment on the western shores of the Georgian Bay and navigates through the ski trails of the Blue Mountains. The event's stop in Ontario features numerous events from a 5K all the way up to a 50-miler. There's also a marathon relay team and a kid's run! We're also giving away TWO entries to the races in Ontario! To enter, simply retweet the tweet below by 9:45 p.m. ET Sunday, June 18 AND answer at least one question during the chat. One winner will be announced at random in the final 5 minutes of #RunChat.